paper 0-300-07561-8 Longtime New Yorker writer Mehta (Remembering Mr. Shawn’s New Yorker, 1998, etc.) takes on the “awkward task”of selecting pieces representative of his 40-year career. Mehta published his first book in 1957 at the age of 21 following his first year at Oxford. He would write 20 more, many autobiographical or based on essays that originally appeared in the New Yorker, whose editor, William Shawn, taught Mehta the “principles of good writing . 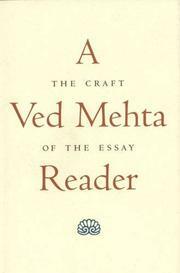 . . clarity, harmony, truth, and unfailing courtesy to the reader.” At his best, Mehta is a stylist whose personal fascination with a subject can lend energy to the essay form, as in “The Train Had Just Arrived at Malgudi Station,” his lengthy profile of Indian novelist R.K. Narayan. Conducted in New York, his interviews of Narayan do reveal both the literary figure and the man. Sitting in Narayan’s borrowed apartment on East 57th Street, chewing betel nut, the two men range in conversational topics from Narayan’s takes on Western writers—mostly “bores,” such as Joyce, Hemingway, and Faulkner—to tearful recollections of his late wife. Mehta also does a marvelous job in “Nonviolence” of examining Mahatma Gandhi’s controversial celibacy and how this ahimea, or “love force,” prepared him for his history-making work. However, Mehta is sometimes indubitably long-winded, as in his overly long piece on the spite and vitriol of British philosophers in the early 1960s, which has little to recommend it. He relies on interviews with “John,” an Oxford lecturer who spoke “too frankly and unprofessionally to wish to be identified.” And Mehta’s dry presentation of stale data in his 1970 article on Calcutta’s poverty is relieved only by his brief look at some early criticisms of Mother Teresa (e.g., her lack of medically trained staff and her grandstanding acceptance of only “the most extreme and dramatic cases”). Too many pieces here are too mired in the time when they were written to endure.